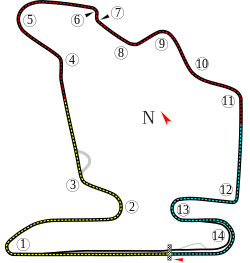 ^ 1.0 1.1 Formula 1 Magyar Nagydíj 2016. Formula1.com. FOM. 2016-07-22 [2016-07-22]. ^ FIA confirms 2016 calendar. Formula1.com. Formula One Management. 2015-12-02 [2015-12-02]. ^ 2016 Formula 1 Hungarian Grand Prix – Qualifying. Formula1.com. Formula One World Championship Limited. 2016-07-23 [2016-07-23]. （原始内容存档于2016-07-12）. ^ 2016 Hungarian Grand Prix – Qualifying Session Official Classification. FIA. 2016-07-23 [2016-07-26]. ^ 5.0 5.1 2016 Hungarian Grand Prix – Official Starting Grid. FIA. 2016-07-24 [2016-07-26]. ^ Formula 1 Magyar Nagyaíj 2016 - Race Result. Formula.com. Formula One World Championship Limited. 2016-07-23 [2016-07-25]. ^ 2016 Hungarian Grand Prix – Official Race Classification. FIA. 2016-07-24 [2016-07-26].